Ever not paid for that cup of serve-yourself coffee by ignoring the “money-here” sign? Have you taken two pieces of free candy when the sign said take just one? What about cheating on an exam, plagiarizing a paper, or lying? These are all dishonest acts, albeit ones that vary in magnitude. Our day to day lives are peppered with various moral dilemmas. What influences whether we stay moral? More importantly, know that one transgression can lead to more. Research by Neil Garrett and colleagues suggests that if we have a chance to do something dishonest repeatedly, we do not feel as bad about the act the more we do it . First, the big picture. We all believe we want to do the right thing. Predicting why we do and why we do not has occupied many psychological scientist for some time. Our ability to make moral decisions develops when we are young and involve an interaction between how we think (cognitive processes) and how we feel (emotional or affective processes). The developmental psychologist Lawrence Kohlberg suggested we all process through major stages of moral development. His classic studies involve asking people to read and respond to different stories involving various immoral acts. In one story, a man steals a drug to save his dying wife. Participants had to provide reasons for why they thought the act was right or wrong. Apparently, our reasons change as we age. Younger children favor personal interest. Older children and young adults are more likely to weigh in societal rules and laws. At the highest level of moral reasoning, people weigh the actions in terms of the greater good to society. If that is too cognitive and you think something is missing, you are right. Other researchers focused on emotional components. We do right because it feels right. Two feelings in particular are empathy and sympathy. If you can empathize with someone, essentially feel what they are feeling in that situation, you are less likely to wrong them. Similarly, if you can sympathize, essentially feel concern, pity, or sorrow for others, you will also be less likely to wrong them. As you can guess, we also learn to do the right thing (or the wrong thing) from watching others. You may have heard of the Bobo doll study. Bandura had kids watch adults hitting a big inflatable clown doll (a Bobo doll). When left alone with the doll, the kids hit the doll too. Hitting is wrong, but if the kids saw adults do it, they did it. This social learning theory explains much of why we do what we do and shines a light on the roll of parents in the development of children’s behavior, but also reminds us of how important other people’s behavior and media portrayals of it can be. If people are racist or sexist around you (especially prominent people in power) and if this behavior is visible (thing circulated on social media), the behavior is likely to be copied even though it is wrong. There is one more important part to understand. We are guided by our physiological responses. We tend not to do things if doing it makes us feel bad. When we are contemplating doing something wrong, if we are physiologically uneasy (say our heart is beating faster) we are less likely to do it. In fact, different studies show that when you increase a person’s heart rate, say by having them drink something, they are less likely to do something dishonest. 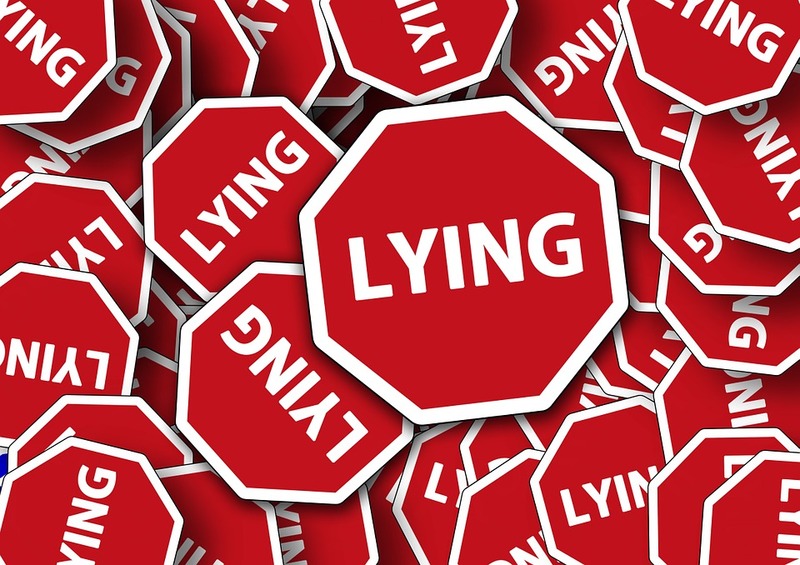 In one study, having participants listen to a fast heart beat decreased their lying behavior. 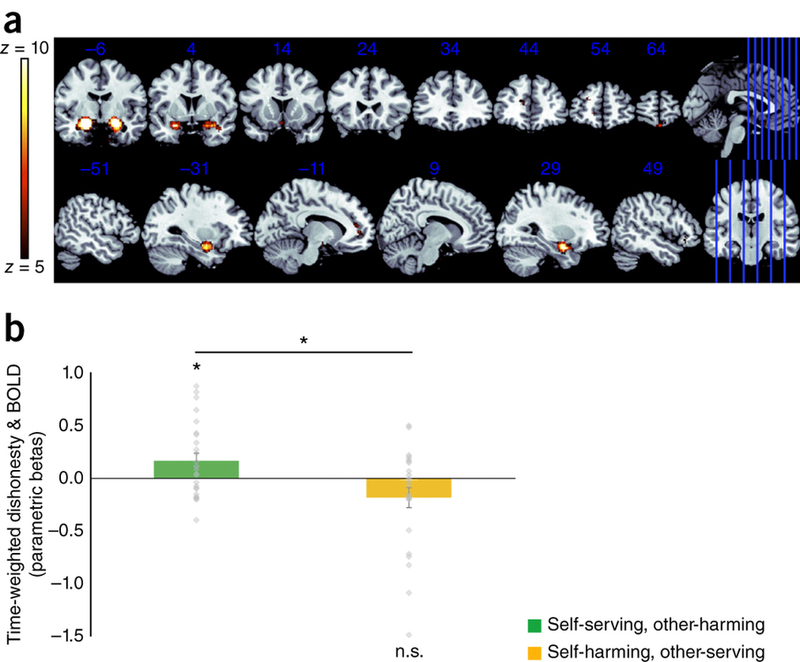 But does our brain change with repeated dishonesty too. This is where Garrett and colleagues’ study comes in. Garrett asked had two people come to the lab. Unknown to the first participant, the second participant was paid by the researcher and part of the study (technically called a ;’confederate’). The real participant was to tell the confederate how much money was in a jar filled with pennies and was provided with incentives to lie. Over different attempts the amount of dishonesty increased. 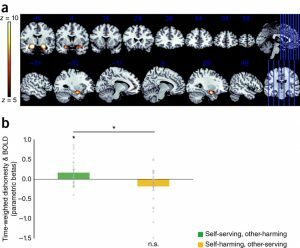 Even more interesting, the activation in the part of the brain associated with negative emotions (the Amydala) decreased over time as well. The bottom line is that dishonest and immoral behavior stems from a variety of different factors such as stage of moral development, emotional and physiological reactivity, and also observation. The finding of note is that we habituate to the warning signs our bodies give us. 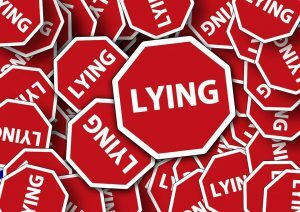 These signs could prevent dishonesty. Pay attention to them. If you feel like a behavior may be dishonest: Consider the feelings of others involved and pay close attention to what your body is telling you. ⟵Just Say No (To Providing Class Slides)?